During the build-up to Manchester United‘s quarter-final clash against Barcelona, Chris Smalling grabbed all the headlines when he stated that he was very much up for the challenge of facing off against Lionel Messi. While numerous followers of the game labeled him as unrealistic and over-confident, the Englishman proved his worth during the 1-0 defeat on Wednesday night. The centre-back dealt with Barcelona‘s offensive threat quite successfully for a majority of the match, and the sole goal was merely a result of Luke Shaw deflecting the ball into his own net. 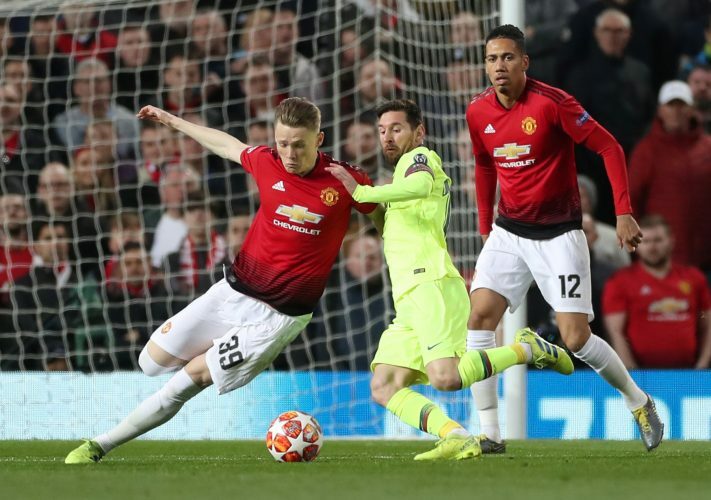 Lionel Messi endured an uncharacteristically quiet night at Old Trafford, as he was largely subdued by the Red Devils’ defence. One moment during the encounter saw Messi collide with Smalling, as the latter jumped high above the Argentine wizard to win the ball in the air. However, the defender also ended up catching the Barcelona talisman, who ended up with a bloodied nose. While Messi was evidently annoyed at the challenge, Smalling has revealed that the 31-year-old was aware that the nature of the clash was purely accidental. The England international also went on to speak about his encounter with Luis Suarez after the full-time whistle, as he added: “Suarez [came up to me] after the game as well. We had a good tussle and he just shook my hand afterwards and said ‘good luck’.